Soheila Shabaniverki, a Ph.D. student in ME. A project by a mechanical engineering researcher could improve manufacturing processes for agriculture equipment companies in Iowa and beyond. Jaime J. Juárez, an assistant professor of mechanical engineering (ME), and his research team have been studying ways that composites can be modified to create a stronger, more durable end product. Their research was the cover article in the December edition of the journal Chemical Engineering Science. Juárez explained that typically particles and polymers are blended together, similar to how ingredients are mixed in a kitchen blender. A recent simulation study of particle-polymer composites found that by packing the particles together to form a structure within the polymer, it increased the strength of the composite by a factor of 100 beyond what the blended particle-polymer composite is capable of. In this study, Juárez and his team used an acoustic field to pack the particles together, forming a structured particle-polymer composite. “As a plate vibrates it also generates small sound waves, any particles on top of the plate will move around due to the pressure caused by the sound waves. The particles will eventually settle in areas were the sound wave generation is minimal, thereby forming into patterns that change with frequency,” Juárez said. Work on this research began in the summer of 2017, as a project within ME’s Multiscale Sensing Actuation and Imaging (MoSAIc) Research Experience for Undergraduates (REU) site, a program supported by the National Science Foundation. 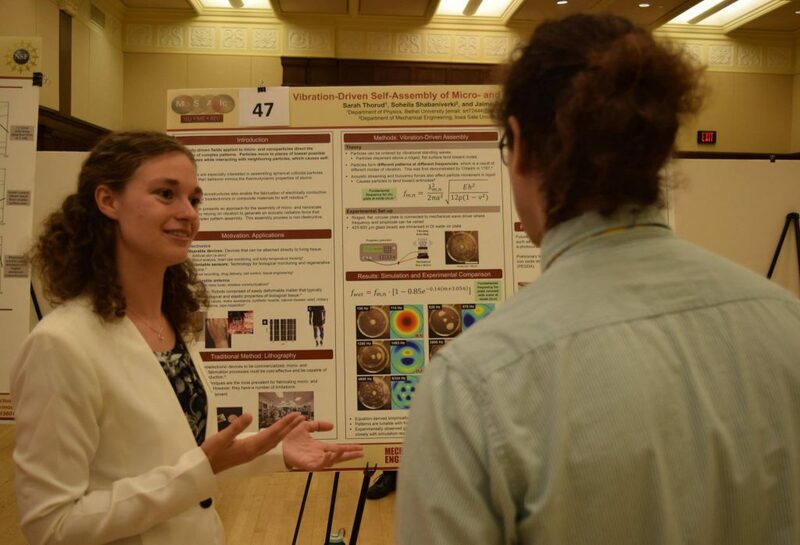 Juárez served as a faculty mentor for Sarah Thorud, an undergraduate physics student at Bethel University, who was studying how small particles assemble under the influence of a vibrating plate. Soheila Shabaniverki, a Ph.D. student in ME at Iowa State, also advised Thorud and was part of the research team for this project. Research Symposium at the Memorial Union on August 3, 2017. This research can be applied to the field of additive manufacturing, which according to the 2018 Wohlers Report, exceeded $7.3 billion in revenue and continues to grow. Juárez said that one of the major challenges in the additive manufacturing industry is discovering ways to deposit different types of materials simultaneously. His research examines ways that acoustics can be used to form different types of materials in a single process by changing the applied frequency. He added that this research can have an impact on the manufacturing industry in Iowa, specifically with companies like Pella-based Vermeer as well as 3M, which has a plant here in Ames. “Stronger polymer-particle composites can be used in a variety of manufacturing processes that directly impact Iowa. Companies like Vermeer and 3M use polymers to create components for products like agricultural equipment or aftermarket automotive supplies. Processes like the one described above can be used to make some of these products stronger or more resilient to wear and tear,” he said. 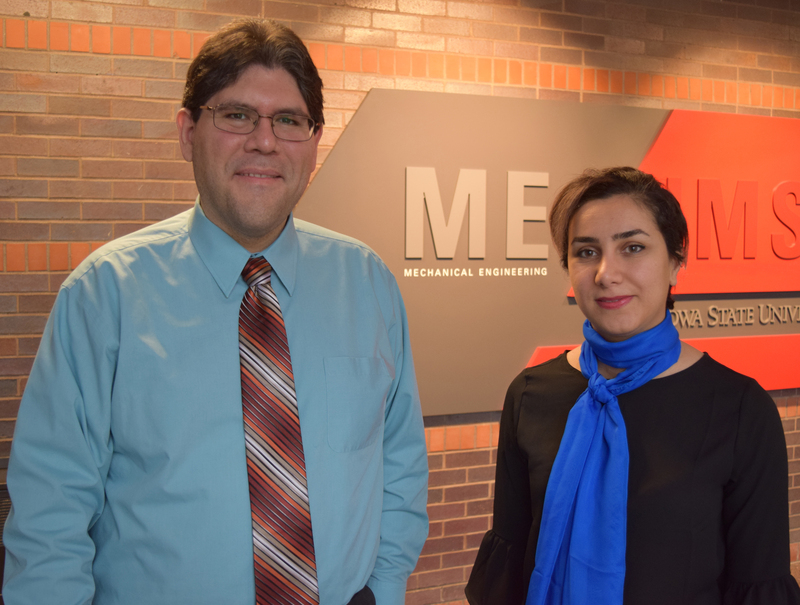 The next step for Juárez and his team is to use their additive manufacturing platform to create a functional material that can be used as an active component for a mechanical actuator or robot. They are also looking at ways to miniaturize the process so that it can be mounted on a 3D printer.